The 2018 Bid Data Expo of Guiyang is now history. It closed Tuesday after four days of successful events and exhibitions. Details of the event, along with participants and exhibitors can be found at the Big Data Expo website: BIG DATA CENTRAL WEB SITE. 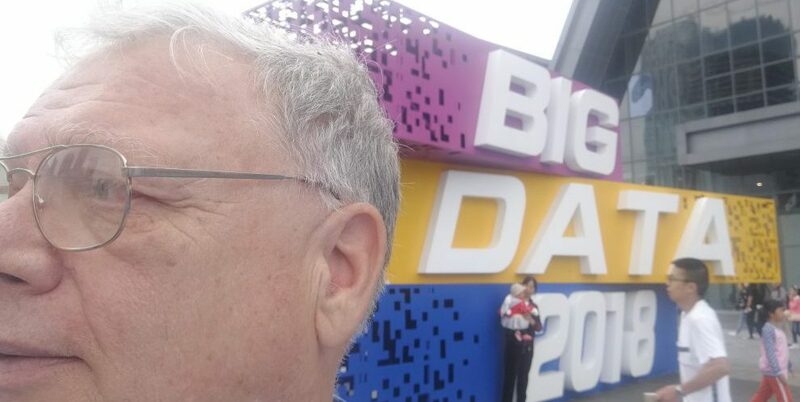 2018 Big Data Expo rocks according to Jack. There were many similarities to the 2017, but also a surprise. It was beyond even my wildest overactive imagination. I wasn’t shy about my disappointment in the 2017 Expo because it was so lacking in robotics, motion control, and automated vehicles. I consider this to be central to our future as humans . . . see: 2017 Big Data Expo. Though I was unsatisfied with the robotics, motion control and automated vehicle coverage in the 2017 Expo, I was MORE THAN SATISFIED with it’s prominence in 2018. Artificial intelligence (AI) was everywhere in the Pixmoving presentation. The highlights were the coffee robot, the donkey car race, and the driverless car. The coffee robot demonstrated the fine detail, proving how far robotics and AI has come. The donkey car competition showed how difficult it is to drive a car, even in fairly predictable environments and situations. The Exhibition Hall was open from the 26th to the 29th and there were also classes and presentations on the 25th. This conference was similar to prior conferences in that special tickets allowing more access were available. One impressive presentation was about the use of Big Data to expedite the permitting process for businesses. Rather than using staff time and a complex permitting process for each department, more departments are being merged and application forms are being populated by the government’s Big Data database. This eliminates fees and long waiting periods while applications are processed. If your registration with the government is in order, you get your permit — quickly. This kind of cost cutting and convenience to citizens is a big deal. The exhibits seemed less expansive than in the past, with a bit of a push from a few vendors expanding presence. Of course Pixmoving was the biggest. Google and Facebook were also well represented, along with many of the other big names. Smart City software, mapping software, and health care were big. Of course virtual reality and the “whole body” virtual world devices were present as well. Here are some sample photos. All in one digital healthcare. I just stumbled onto a recent post about Libo, in the extreme south of Guizhou. It is a minority section of Guizhou and is advertised as the most beautiful county in China. This is a Youtube video so it requires a VPN if you are in China. I was invited to visit Libo and decided to do a search on the internet . . . The Guizhou Wine Expo had a promotional video detailing the attractions of Guizhou. I captured part of it on my cell phone camera. Then I pulled out an old video from when I visited the Miao countryside. The song of the Miao Women when they ask you to drink their sweet rice wine is really extraordinary, and in no way exaggerated by the promotional video. I’ve added a couple clips . . .
Forest Park is one of the more beautiful parks in Guiyang. The central feature of this park is the tomb of Dr. Guy Courtney. November 7, 2013 was the Sports Day across China, with regular classes dismissed and a chance for a day off for foreign teachers. Teachers have weird days off here in China, even more than in the USA, but that is another subject. I took the opportunity to visit Forest Park, southeast of Guiyang. It is a park-like atmosphere in a forest setting. 🙂 The real reason for my visit, rather than just getting fresh air on a beautiful day, was to visit the memorial tomb of Doctor Guy Courtney. The history of China is rich. The contacts with our western democracies haven’t always been positive. In the 1800s China fought and lost two “Opium Wars” with the British Empire, the result of which was that the British East India Company got the right to sell opium freely in China, a very profitable business indeed. Chinese courts had no jurisdiction over foreigners committing crimes in China, who had to be tried in a European appointed court. The Taiping Rebellion, with millions of Chinese killed, was also inspired by the western missionaries seeking to get a more Christian style Chinese government. Westerners eventually were supportive of the Manchu government due to treaty concessions to Europe following the Second Opium War. After that, Europe and the west really had nothing to gain by a regime change. American and British citizen forces eventually defended the Manchu Dynasty in Shanghai, defeating the Taiping Rebellion. (See: http://taipingrebellion.com/, http://en.wikipedia.org/wiki/Taiping_Rebellion, and http://www.infoplease.com/encyclopedia/history/taiping-rebellion.html) . Then the US became more active in Asia by winning the Philippines from Spain in 1899 and winning the war with Japan in WWII. The peace treaty ending WWII was challenged by Maoist China in Korea. After China’s massive losses in Korea on top of the other historical irritants, one might think that westerners would not be particularly welcomed in China. That is why I was so surprised when I saw the tomb of Dr. Courtney (see: http://www.bbc.co.uk/history/ww2peopleswar/stories/91/a3510091.shtml). This memorial is in memory of Dr. Guy Courtney, a British woman doctor who came in support of the Chinese war of resistance against Japan in 1941. Dr. Courtney died at her post in 1942 while working to prevent and cure the diseases caused by the germ warfare waged by the Japanese.